Q. When you write books for children, do you have a specific goal in mind, aside from telling a story? A. The goal is always that what the whole children’s picture book project starts with. The story is just the appropriate tool to reach your goal and express your idea, or message. In the case of an effective children’s picture book the pictures don’t just illustrate the story. They actually play the more important role by reaching your goal, or transmitting your message. Nowadays, I see a successful trend of creation of children’s picture books even without the use of any written words to express a very powerful message to the “little readers”. Therefore, before I even started to write, I was looking for the right balance between a written story and the story the children will find with help their fantasy and imagination from the pictures. Instead of writing a “classic” story with everything spelled out, I decided to only give an impulse and let the children create their own story in their fantasy and imagination. That’s my goal with creating the children’s picture book series about HAPPY TOBY. I want children – as well as their parents and grandparents reading the stories out loud – to discover and realize, the real value of life and the importance of the right relationships with their family, with neighbors, friends, classmates, etc. My goal is to demonstrate that happiness, love and friendship belong to the things in life which money cannot buy. Making others happy makes us happy.I’m happy that when I read my books in front of hundreds of children at events in schools and libraries I see by the children’s reactions and comments, that I chose the right approach to reach my goal. Q. How long does it typically take to put a children’s book together? A. For my “first baby” so to speak, it took me almost two years to find the right illustrator. I contacted many different artists around the globe but nobody’s style and expression fit my imagination. Finally I found Marek Mertinko, who was at that time graduating from the Academy of Fine Arts in Bratislava, Slovakia. 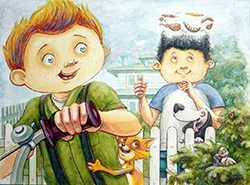 After creating the main characters it took him four months to finish the hand-made illustrations for the first book HAPPY TOBY-Toby and His Family. It was a very exciting and interactive process between him and I via Skype and email, because he lives in Slovakia and I live in Florida. I put together a dummy book and was looking for a publisher. After some bad experiences with different publishing companies I decided to start my own publishing company. I put together a highly educated artist team. Beside Marek Mertinko as the illustrator I contracted Jitka Janeckova as the Graphic designer, Pavel Kordos as the scan specialist, and the DEVIN Publishing House to have my book printed in hard cover and offset printing quality. After the team work was done and the book was ready to be printed it took eight weeks to have my first 3000 copies not only printed, but also packed and shipped from Bratislava, Slovakia to my company HAPPY TOBY™ PUBLISHING in Naples, Florida. Q. Have you had some influence over the illustrations in your Happy Toby books? A. The pictures in my book series don’t act as just supporting illustrations. The illustrations in my project are a very important part of my goal, message, or “moral notice” I want to bring to the little readers and to them, they will read to them out loud. 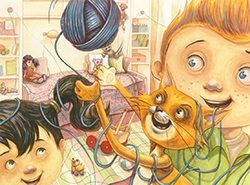 Inside all of the pictures (I don’t like to use the word illustrations) is a little simple story encoded in all the small details and surprising, creative – and often funny – elements to spark the reader’s imagination. Everybody can find something in the pictures that resonates with his or her own life experiences, similar to the main character’s in the illustration. My intention was not to express everything in an extensive and didactic story. That is why I was so “thrifty” with the text. One picture is worth more than a thousand words. I think that’s the right way to attract children to start to read books. Those who don’t read yet as well as those who make their first attempts. So, to answer your question I have to say yes, I had a lot of influence over the illustrations. It was an important part of my book creation. My illustrator and I were working very closely and we had a creative influence on one another. This cooperation contributed very positively to the final form of the book. Q. What inspired the two different illustration approaches (detailed vs. simplistic) in your Happy Toby books? A. The combination of these two styles characterizes Marek Mertinko’s illustration style. That was one of the reasons I chose him to illustrate my children’s picture book series HAPPY TOBY. We decided to combine the realistic with the unrealistic elements together in one pattern to encourage the imagination of the children to see the things around them in the real world differently. Hyperbolize, oversimplify, ironize,etc…Every subject, every thing, even a simple toy like a teddy bear can have its own character, its own life. You just have to take the right look. 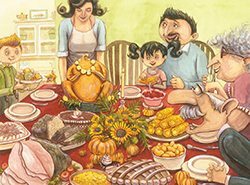 The many surprising details leave a lot of space for a child’s fantasy and so reach the goal of the illustration style. Q. Did you have a particular age group in mind when the illustrations for Happy Toby books were being conceived? A. I had to have three age groups in my mind before I began planning the illustrations for my book series. The first group is the children who just started to read (6-7). The second group is the children who need to have the book read out loud (0-5). The third group are the parents, grandparents, and other adults that will take my books in their hands and read them to the little folk out loud. I get comments from the adult readers about how happy they are to find moments in the illustrations that make them smile and bring back memories from their own childhood. Reading the book out loud creates moments where two generations start a dialog about the real values of a happy childhood. Q. 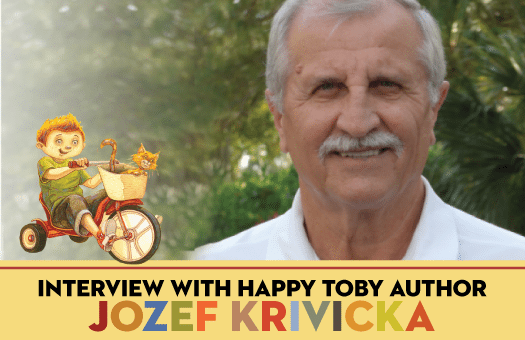 Did you imagine that a child would read your Happy Toby books independently, or be read to? A. I imaged both. I have many positive reactions and comments from both groups at my signings, presentations, and selling events. The parents and grandparents buy the books and want to read them out loud to have fun with their children and grandchildren. At the school events, the children simply want to have the book and then ask their parents to get it for them. I think the topic of the book series as well as the humorous illustrations attract both, young and old. Q. What senses do you hope to engage the most in your readers. A. I hope to address the young readers as well as the older readers visually and emotionally and help them to perceive the beauty of everyday life. Reading the catchy rhymes and discovering happiness in artistically created illustrations will show children the beauty of everyday life. If the child is too young to read and has to have his or her parents or grandparents read the book, they will very likely discuss the importance and the beauty of the moments spent together as a family. They will discover again and again new details in the masterfully pictured moments of happiness in Toby’s life. They will desire to have the same meaningful relationship within their own family. The intention of the HAPPY TOBY children’s picture book series is to discover, adopt, and enjoy the real value of a happy life. Each book of my series deals with a different kind of relationship. HAPPY TOBY-Toby and His Family is about happiness in the family and HAPPY TOBY-Toby Has a Party is about a happy neighborly relation. The future story will be about a successful and funny cooperation of young and old by accomplishing a dream project with the tentative title HAPPY TOBY-Toby in The Sky. My children’s picture book series concept is very different in comparison with other books for this age group you would find in bookstores. Many of these books use personified animals in their stories to attract the children’s attention and communicate moral values. In my books I try to bring the readers to think about what makes people happy. I give them a lot of clues in the text and illustrations and it’s up to their imagination how they will transfer their own vision of happiness to their life. There are no fictitious characters with extraordinary capabilities or miraculous power in Happy Toby’s stories to misguide the child imagination about the real values in the life. The real heroes of Toby’s happy life are the members of his family, his neighbors, friends, classmates, teammates and all the people in the community. Q. Do you have a vision for expanding the Happy Toby series? 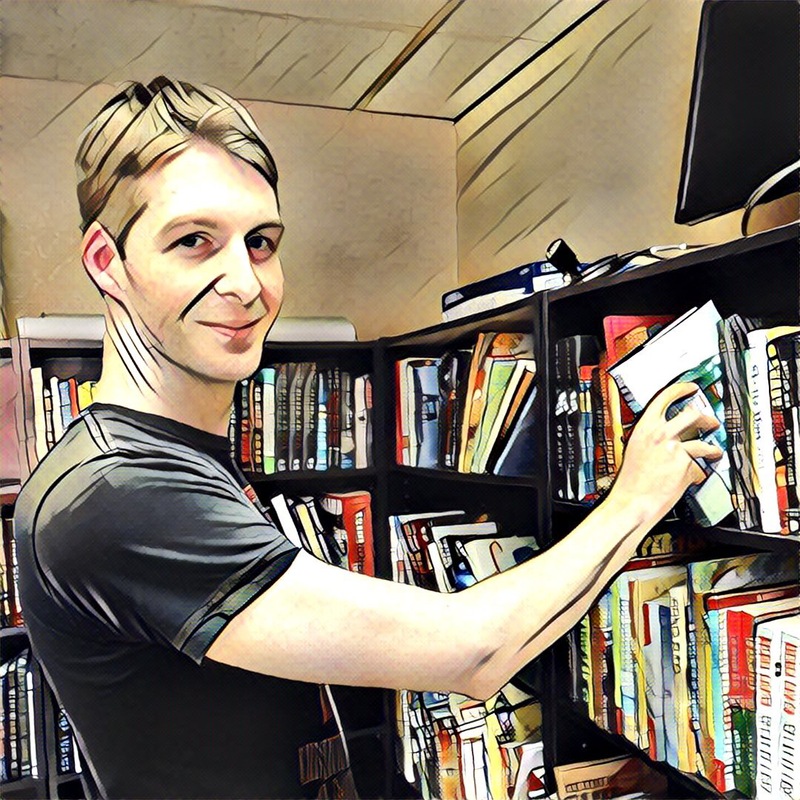 Will future books follow the same basic format? A. Yes, I will continue the Happy Toby series and don’t intend to change the format and style. In the creation process of the additional books I may make some adjustment to the illustration ideas or stories concept, if they will support my goal. I presented my concept to somebody who is working in the movie industry, and he showed very strong interest in using Happy Toby for an animated children’s TV series. Q. What element do you feel work best when putting together a story for children? A. Every author probably has his own feeling about the working elements. In my case as a children’s picture book author I prefer the active factor of a simple everyday story and an artistic and humorous illustration. I don’t like difficult and heavy stories thick-sown with lessons. A lesson actually should be the result of a book and the reader’s imagination. Q. Are you interested in writing for other age groups? Anything in the work? A. Aside from continuing to work on the Happy Toby series I’m also working on a humorous story about a Chinese housefly for ages 8 and above. It’s a completely different story concept than Happy Toby. I also have another project in the works with the tentative title Silent Fish Amalia, where the illustrations play a substantial role. I also started working on a mystery novel project for adults with the tentative title Over The Hump. There is definitely a lot more to come.